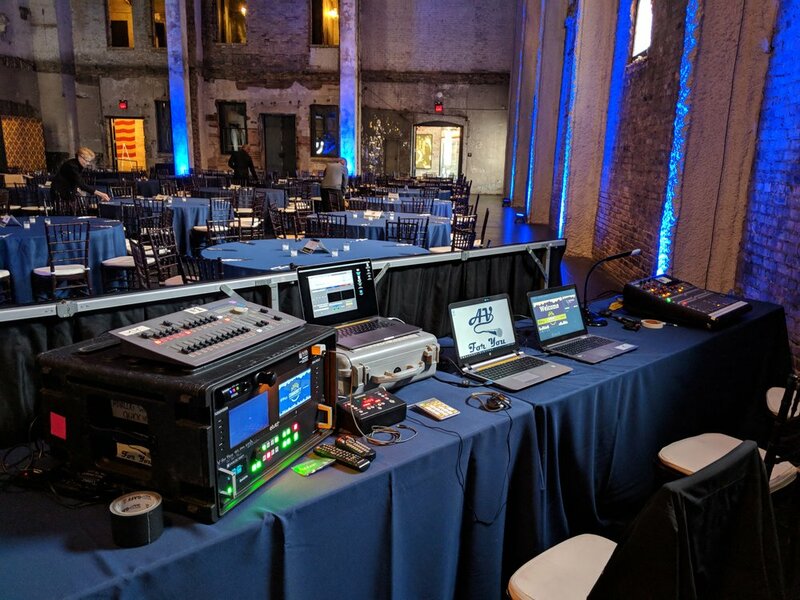 AV for You provided audio, video, and lighting for the Minnesota Business Magazine's Community Impact Awards at Aria in Downtown Minneapolis. For audio we set up four of our JBL VRX Line Array Speakers. Two VRX speakers were set on our two Duratruss Crank Stands allowing us to get the speakers high in the venue for even sound dispersion. We also set up our Audio Technica Podium Microphones on our frosted podium on stage. For video we rear projected our Eiki 7KHD Projector onto our Screen Works 9' x 16' Truss Folding Screen. We set up a Confidence Monitor for the presenter to see the program on screen during the event. We used our Decimator SDI-HDMI Cross Converters to distribute the same video signal to both the projector and the confidence monitor. For lighting we used four of our Chauvet Ovation E910-FC lights for a stage wash. We also set up two Ovation E910-FC lights for gobos projected above the stage, in which we changed the gobos to show blue and green colors. Stage view picture featuring frosted podium, confidence monitor and background lighting. At the tech table we used our Behringer X32 Producer for clean sounding audio production. We also set up an Analog Way Quickvu Video Switcher and Playback Pro laptop for seamless switching between powerpoint slides and video rolls. We also set up our ETC Smartfade lighting console to control the brightness of the stage wash and brightness/color of the gobos.